Congratulations! If you’re here exploring Hitchbird.com, chances are you’ve gotten engaged recently. As you bask in the glow of your engagement, you might also start to feel overwhelmed by the thought of planning a wedding. Probably even more so if your ideal wedding happens to be one that takes place overseas - twice the romance, twice the difficulty in planning? I'm Tammy, the founder of Hitchbird. When I planned my destination wedding, I made a few mistakes and I don't want you to do the same. Through some unfortunate circumstances, the date of my wedding had clashed with the passing of a member of the country’s royalty and a political rally - so all the airports were shut down. However with friends and family flying in I had to quickly re-schedule the whole wedding to a different city, which meant finding new wedding venues and vendors! 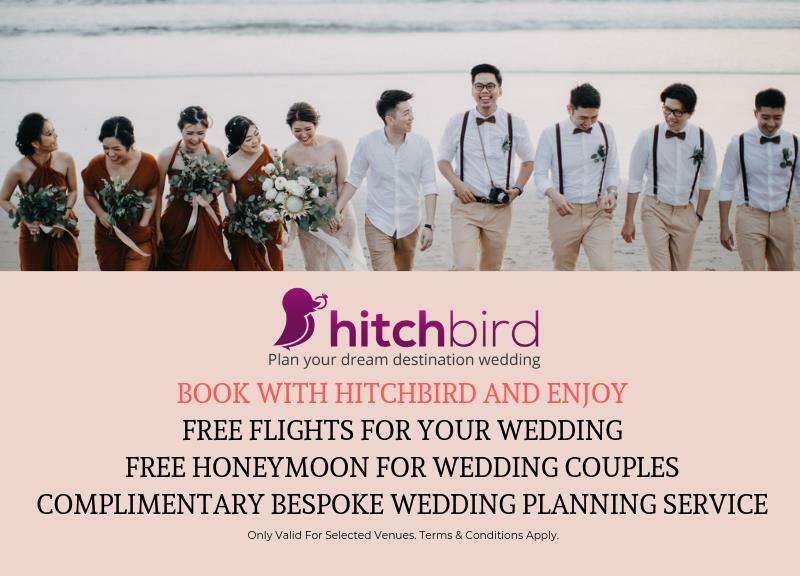 That’s why I created Hitchbird - to make sure you have the best experience in planning a destination wedding by making the process as simple and fail-safe as possible. You probably have a ton of questions about destination weddings in Asia... Where are the best cliff-top villas in Bali? How can you get legally married in Phuket? Who's doing the best deals at the moment? Which venues have the most Insta-worthy beaches? We can help you in your wedding planning journey by providing expert advice on which venue best suits your needs, and do the hard work of speaking directly with hotel management to get the answers you need. Just like how we recently helped this couple ! Our team on the ground visits wedding venues and vendors every day around Asia, so you can be assured that your booking is safe with us. Terms do apply, so please contact us or WhatsApp +6011 2698 6450 for details while these deals are still available! If you prefer talking over texting, feel free to arrange a video chat with me or one of our experienced concierge team advisors with the click of a button.